Strongly angled sunlight streams through our windows in the winter months. 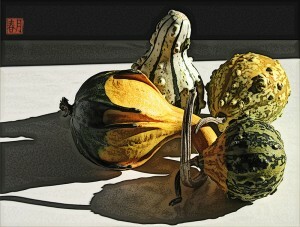 It made marvelous shadow patterns on this grouping of decorative winter gourds. Had fun exploring ways of texturizing the shadow details and enriching the subtle color reflections as I worked on this image. Production Notes: Archival, velvety matte paper with pigment inks (rated to last 100+ years). All prints have white borders for handling & framing use. *MINI & SMALL sizes would make wonderful display groupings for images related by color, subject, or season.